Malta had to settle for the bottom spot in Group D3 of the UEFA Nations League following a 1-1 draw with the Faroe Islands at the National Stadium on Tuesday. Two goals in less than ninety seconds within the first four minutes gave the impression that the clash to avoid the bottom of the table would turn out to be action-packed. However shots at goal throughout the ninety minutes were few and far in between. The locals were expected to put more pressure on their opponents as only a win would have enabled them to move third place. On the other hand, the visitors seemed to be satisfied with a draw which guaranteed them third place and a spot in Pot 5 of the EURO 2020 draws next month. Malta coach Ray Farrugia made five changes to the team which lost heavily to Kosovo as Steve Borg and Andrei Agius were back after serving a one-match ban while Clayton Failla, Paul Fenech and Michael Mifsud were handed a place in the starting line-up after being among the substitutes on Saturday. Ryan Camilleri, Jonathan Caruana and Joseph Zerafa were among the substitutes while Luke Gambin was unavailable due to club commitments. Hogg started in goal, with Zach Muscat, Agius and Borg as the three central defenders, Mbong and Failla on the flanks, Rowen Muscat and Fenech were employed in midfield with Corbalan and Mifsud supporting Andre Schembri as the Apollon Limassol striker made his final appearance in the Malta shirt. The Faroe Islands took the lead on the 3rd minute when off a cross from the right, Rene Joensen headed home past goalkeeper Andrew Hogg. However the Maltese reaction was immediate and a minute later, they restored equilibrium. 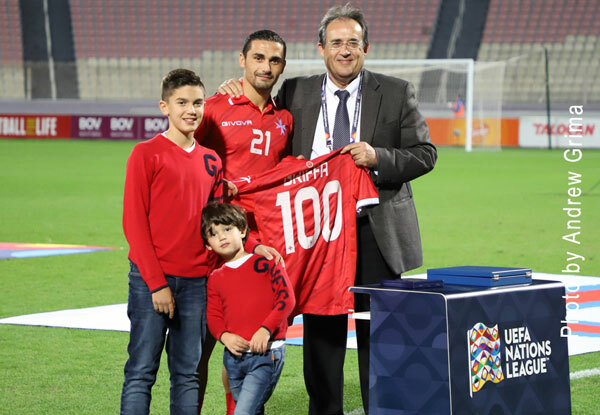 Michael Mifsud received a through pass on the right and tried his luck with a powerful shot from inside the area which was blocked by goalkeeper Gunnar Nielsen and off the rebound, Juan Carlos Corbalan’s low shot from the right beat the Faroese goalkeeper. Clayton Failla tested Nielsen with a shot from outside the area on the 27th but the goalkeeper performed a good save. Ten minutes later, the visitors went close with a Solvi Vatnhamar header following cross from the left by Davidsen. Five minute in the second half, Malta threatened once again with a Juan Corbalan effort from outside the area, served by Failla from the right, with the ball hitting the crossbar and out. A Brandur Hendriksson long-distance effort ended just over the bar on the 64th. On the 72nd minute, there was a short clearance by a defender following a cross by Failla from the left, Andrei Agius headed the ball down for Corbalan who returned the compliment and the Hibs central defender tried his luck with a shot from outside the area which was parried by Nielsen. Two minutes later, Michael Mifsud concluded a solo effort with a low shot from inside the area which was neutral side by the goalkeeper. One minute from time, Malta went close as Omar Faero almost committed an own goal when deflecting a shot by substitute Kyrian Nwoko. Deep in stoppage time, Agius served Schembri but was tackled inside the area with the Maltese appealing for a penalty but the referee waved play on. 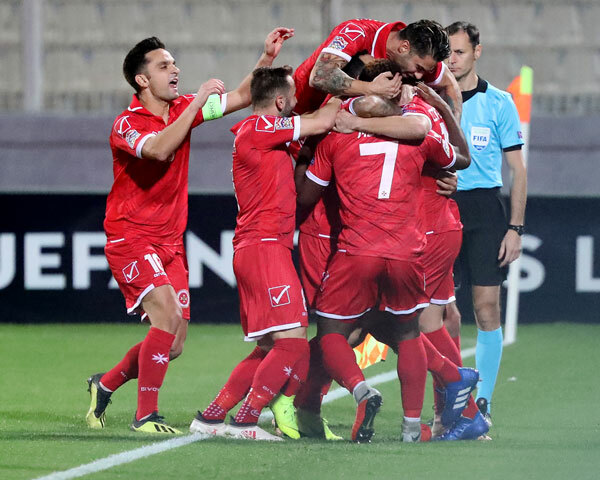 MALTA Andrew Hogg, Steve Borg, Andrei Agius, Joseph Mbong, Paul Fenech, Michael Mifsud, Andre Schembri, Rowen Muscat, Clayton Failla (80’ Kyrian Nwoko), Juan Corbalan (78’ Joseph Zerafa), Zach Muscat (66’ Jonathan Caruana). FAROE ISLANDS Gunnar Nielsen, Viljormur Davidson, Atli Gregersen, Ragnar Nattestad (83’ Omar Faero), Hallur Hansson, Brandur Hendriksson, Gilli Rolantsson, Solvi Vatnhamar (67’ Kaj Bartalsstovu), Heinz Vatnsdal, Rene Joensen, Jakup Thomsen (74’ Klaemint Olsen). This shows how Maltese football is going backwards. If the MFA does not acknowledge there is a big problem, then there should be changes all around the place. Not winning against a small country such as Faroe Island makes me cry.